CAD FILE FORMATS Software File Extension Versions Supported by Viewer Advanced Features*? *Advanced features include geometry-specific measurement options (face-to-face, length of edge, etc) and more file formats available under "Download As..."
After selecting which file format you would like to download your file as, we will start the conversion and email you when the file is ready. This may take several minutes depending on file size and complexity. While in the viewer you can use various mouse and keyboard actions to manipulate the model. The various functions are outlined below. Hide Body right-click on a component and select "Hide"
Isolate Body right-click on a component and select "Isolate"
Show All Bodies right-click on a component and select "Show all"
You can review these by clicking the question mark at the top right of the viewer which will bring up a help menu. 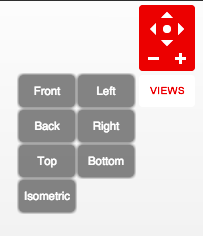 At the top right of the viewer there are red controls which allow you to change how you view your model. You can select a feature (face, edge, or vertex) and properties will appear around the selection. This is only supported for file types where precise geometry (called BREP) is available. This excludes tessellation-only file types such as STL, as well as Inventor files, whose BREP data cannot be read by the GrabCAD viewer. 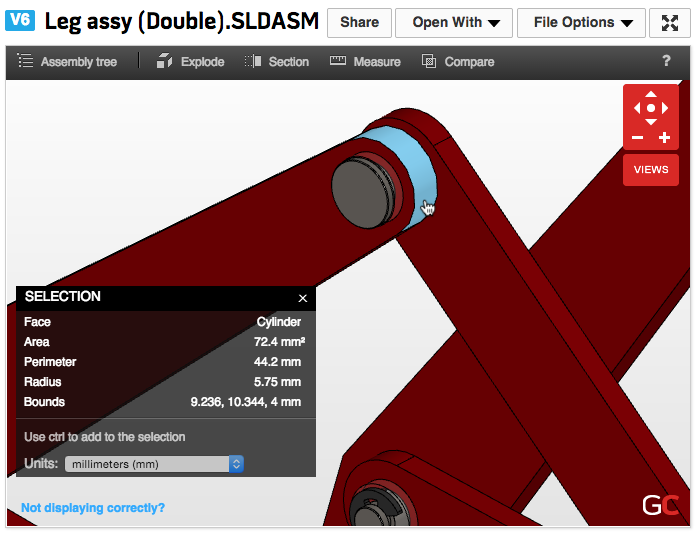 These selection properties will also not be available for assemblies with missing components. 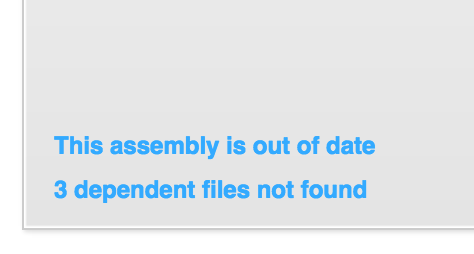 Check the lower left corner of the viewer window for "## dependent files not found." You can also select a whole body using shift-click to get other properties such as volume. You can measure separation between two features by using ctrl-click. 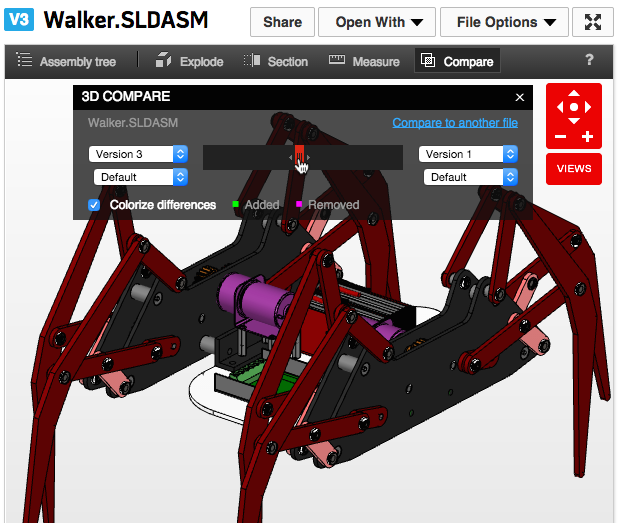 The assembly view options allows you to see all the components and sub-components of an assembly in the viewer. When clicking "assembly view" button at the top of the viewer a window will appear in the top left corner of the viewer. In here you can check or uncheck the box next to a component's name in order to hide or reveal that component. The explode option allows you to virtually pull the components apart in the viewer. 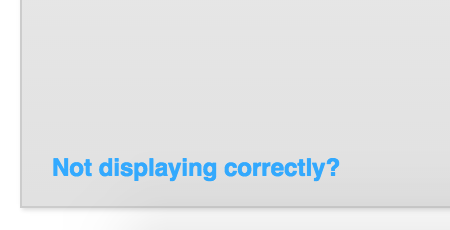 When clicking this option a window with a slider will appear. Moving the slider to the right will separate the parts and moving to the left will bring them back together. The section option will open a window which allows you to virtually slice through your model to see the inside components. 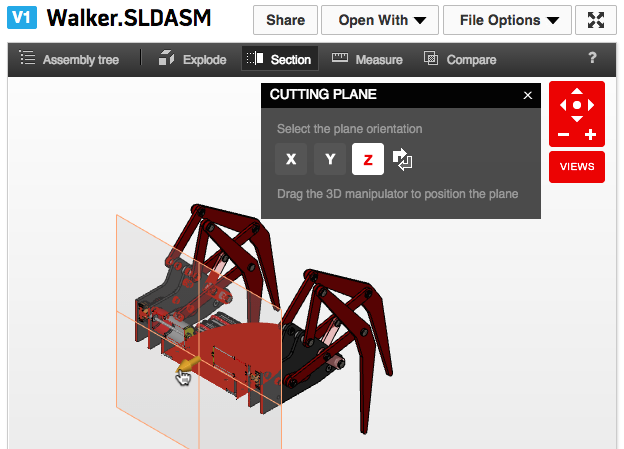 You have the option to choose the axis in which the cutting plane is displayed in the viewer. You can drag the arrow on the cutting plane to move it back and forth through the model. 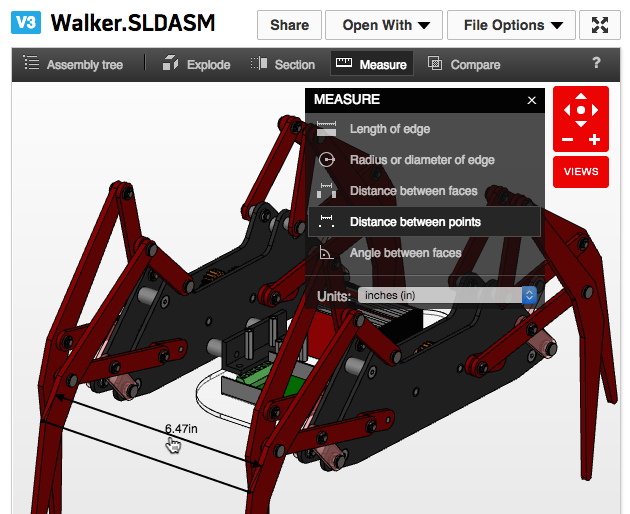 The measure tool option located at the top will allow you to measure the distances of the components in the viewer. There are several differnt options on how to measure component which is outlined below. 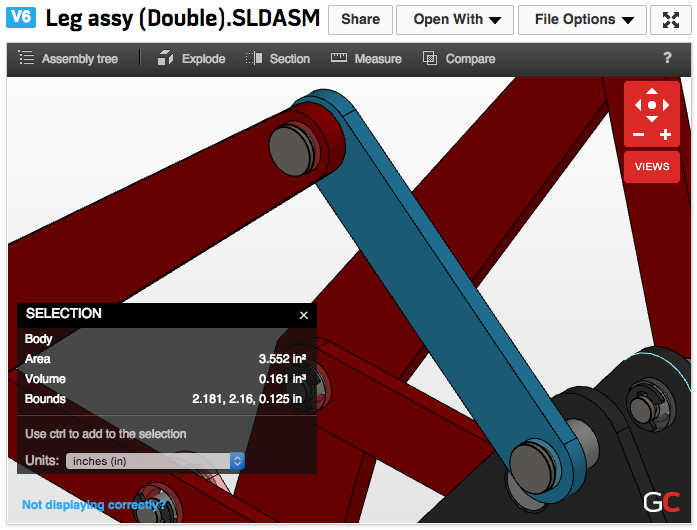 The 3d compare tool lets you compare different versions of your CAD model. This option is at the top of the viewer and opens a window allowing you to select which versions and configurations to compare, a slider to switch between the different versions, increasing or decreasing transparency, and an option to colorize the differences between versions. You are also able to compare to another file which will prompt you to select the file you want to compare. Click these messages for more information. If you are the author of the file, you will see the paths of the missing files, otherwise you will just see file names. 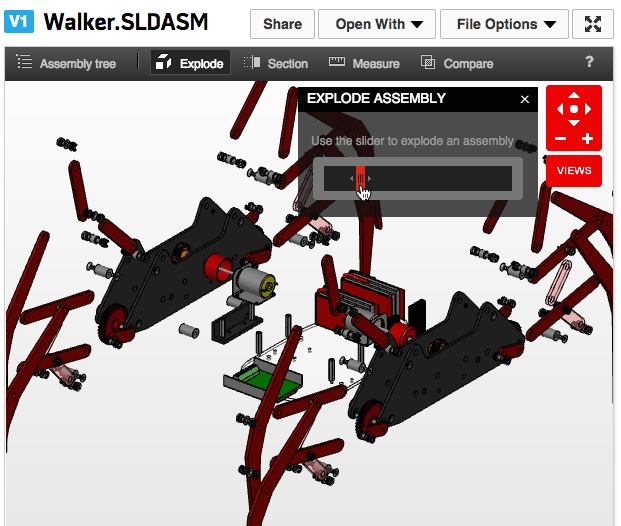 For help gathering all component files into one project see How to get your assembly's files together. 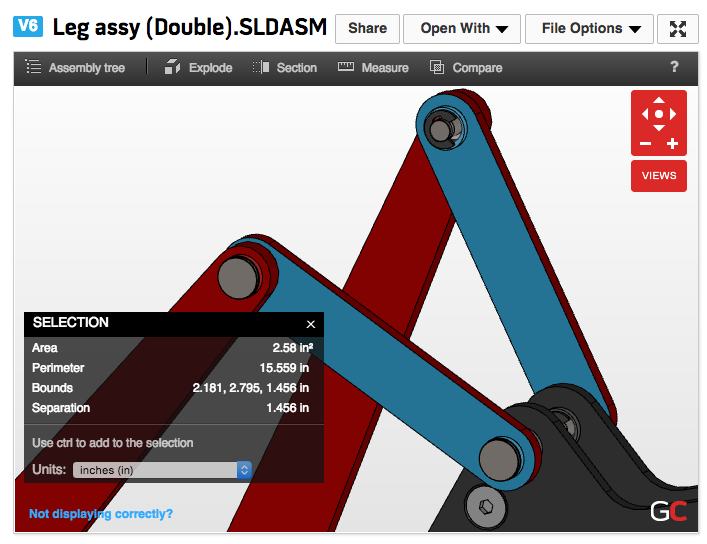 If you are having trouble with viewing configurations, see How to view assembly configurations. If your files is failing to process for viewing, please check the list of supported file formats below. 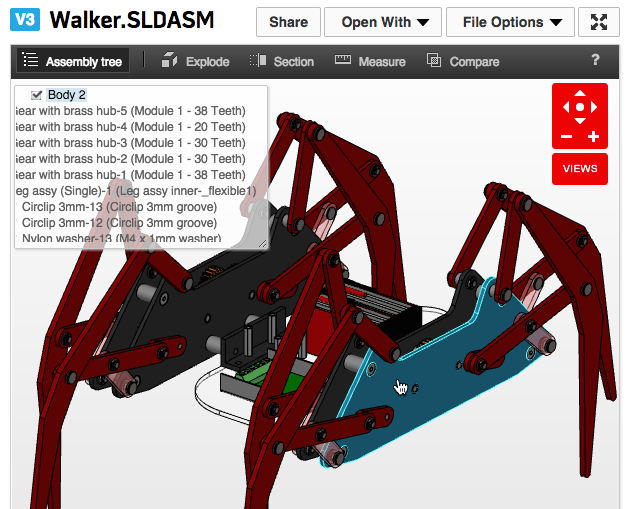 The GrabCAD 3D Viewer runs on a web technology called WebGL. WebGL is supported by most internet browsers, though sometimes you have to enable it in your settings. The viewer should work by default in Chrome. If it does not, please ensure you have the latest version of Google Chrome. Download it here. For further support, visit Google Chrome Help. For further support, visit Firefox Help. Open the Advanced tab, check Show Develop menu in menu bar. For now, the 3D Viewer is not supported in Safari for Windows or Macbook Pro with Retina Display. If you are unable to update to Internet Explorer 11, you can install the Google Chrome Frame plug-in for IE 6, 7, 8, and 9 to enable WebGL. ATI Radeon HD 6490M on OS X 106.